The wonderful Dawn from Dawn’s Inspirations is back and this time she is showing us how to make a stunning Create a Card Decadent Heart card! 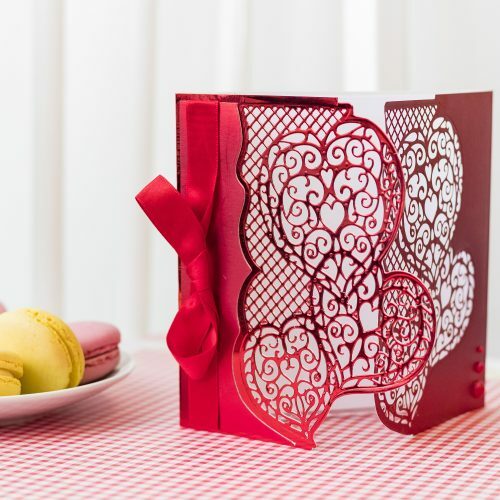 Keep reading to see how to make this card for loved ones! Cut Matt Red card to make a card blank that is 5 ½” x 5 ½”. Cut Mirror card 5 ½” x 6 ½” and score at 5 ½”. Cut Printable light card to a card blank size of 5 ¼” x 5 ¼”. Tape Decadent Hearts Dies and one of the cutting edge dies onto the mirror card and die cut, emboss and remove all the pieces. Next tape Decadent Hearts Die and the other cutting edge die onto the matt card. Remember to use the waste from the mirror card to help you position the die in the correct place. Now die cut, emboss and remove all the pieces. To assemble the card stick the matt and mirror red card together so the cut out hearts are positions on top of one another. Using the waste from the matt card trim 1/8” on the 3 sides and fasten some ribbon around with a bow before sticking down to the front of the card. Stamp a sentiment into your card insert and stick this inside your card. Your card is now ready to write your greeting inside and send.